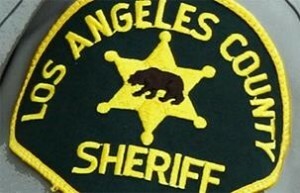 LOS ANGELES – A prosecutor told a federal jury Tuesday that a former Los Angeles County sheriff’s deputy lied to the FBI when questioned about the beating of a visitor to a county jail, but his lawyers contend that the ex-lawman was telling the truth about what he believed he saw. Byron Dredd, who is facing a retrial in Los Angeles federal court, was previously cleared of two counts related to the February 2011 beating of Gabriel Carrillo and its aftermath at Men’s Central Jail visitor center. Dredd is not accused of taking part in the beating. Carrillo took the stand on the first day of Dredd’s retrial, telling jurors how he was handcuffed and brought to a break room after he and his then- girlfriend were found with cell phones, despite signs and verbal warnings that the devices were not permitted at the center. Carrillo said he was pummeled and pepper-sprayed by deputies, while both of his hands were restrained by handcuffs. Dredd, 36, is the sixth ex-sheriff’s official to be prosecuted in the Carrillo assault. Three others were convicted by a jury and two ex-lawmen struck deals with prosecutors. Dredd was acquitted in September 2016 of filing phony reports to cover up the Carrillo assault. The jury deadlocked 10-2 for acquittal on the false statements count, which carries a five-year maximum prison sentence. Attorneys for Dredd unsuccessfully appealed last year to the U.S. 9th Circuit Court of Appeals in Pasadena, claiming that retrial following a hung jury constituted double jeopardy in his case. Although not involved in the beating, prosecutors allege that Dredd witnessed the assault, helped his co-defendants fabricate reports and subsequently lied to the FBI during a July 2012 interview. At his previous trial, Dredd testified in his own defense that his incident report was revised by his boss, but insisted he did not lie to the FBI about what he believed transpired with Carrillo. The assault victim and the two ex-deputies who signed plea agreements testified against Dredd at the previous trial. After the beating, the deputies and their supervisor claimed that Carrillo had tried to attack when one of his hands was uncuffed for fingerprinting. Based on the reports, state prosecutors filed criminal charges against Carrillo, and several of the deputies lied at Carrillo’s preliminary hearing. Prosecutors eventually dropped the case before trial, and the county later paid Carrillo $1.2 million to settle a civil lawsuit. 3 comments for "Retrial begins for ex-LASD deputy on false statements charge"
The last place anyone wants to wind up is in LACSD custody.